We are going to our neighbors’ tonight for dinner. They said not to bring anything, but how can I do that? I haven’t been to the grocery store in about a week, so a fruit salad isn’t an option…. Oh what to do? Then I remember, I have a HUGE box of Guittard Chocolate. I can make a chocolate something. But, I don’t feel like tempering chocolate today. OH OH OH…. I can make a chocolates spread. No, what would they use that for? Well, they could__________….. OH OH OH… I got it…. TRUFFLES~! How easy~! How tasty… How gourmet~! But, I don’t want to make something totally plain. Yet, I don’t think these are people who take big food risks… so chipolte is not an option. What else do I have. Oh look… hazelnuts. hazelnuts are delightful in a 35% milk chocolate. Great! So, I get out 1/2 cup of hazelnuts… toss them in the oven at 300 degrees for about 10 minutes, stirring them every 1 minute. This way they are slightly toasted, which tastes better in chocolate. I chop the heck out of the nuts in the food processor. I get out 3/4 cup of milk chocolate. melt it in the microwave at 50% power, so as not to burn the chocolate. I add 1.5 tablespoons of cream to the chocolate, and mix it with the immersion blender (which has turned out to be a rather useful kitchen tool). Add the hazelnuts and continue to blend. Let cool to room temperature…. form into tiny little balls…. 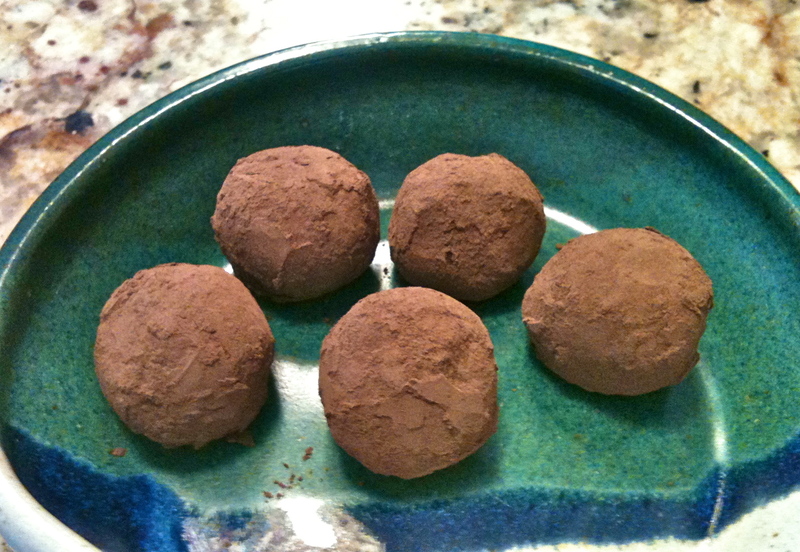 roll in cocoa powder, so they won’t be all gooey on the outside…. and there you go… about 20 minutes of prep time, but spread out over time spent cooling, and toasting the nuts…. Start to finish it takes about an hour, but only 20 minutes of your time. I was quite pleased with the end product. It has 3 phases in your mouth. 1st the cocoa powder, then the truffle starts to melt and fill your mouth, then 3rd, the hazelnut hangs around for the big finish. Fun, easy delicious~!